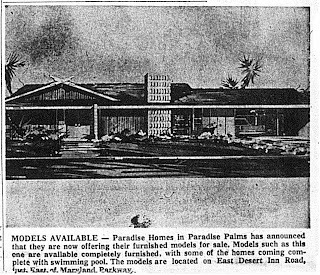 By late summer 1964, most of the builder tracts in Paradise Palms had begun to close out their models. 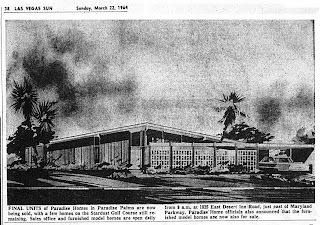 Americana, Fontainebleau and Paradise Homes were the only builders left. 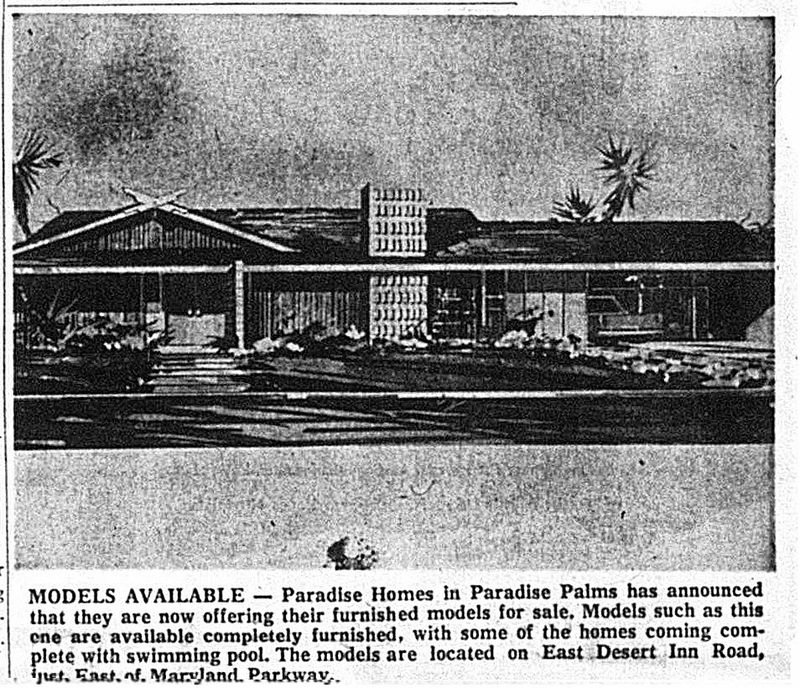 This article from the Las Vegas Review Journal in August, 1964 describes the luxury homes of Paradise Palms a value. 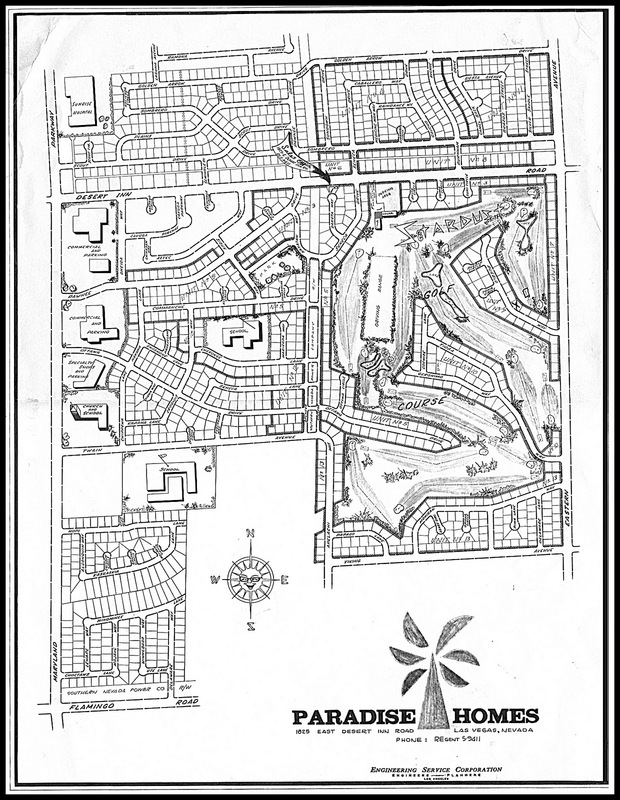 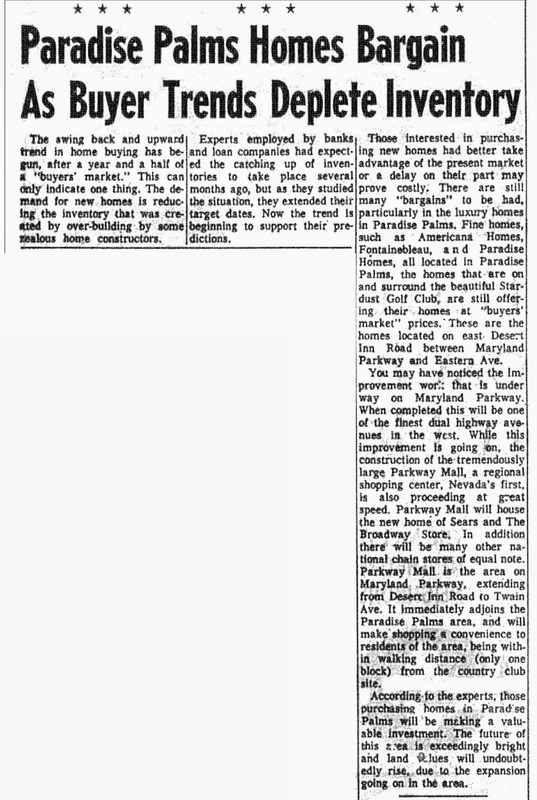 Predicted in this article is a rise in home value due to contributing factors such as the impending Parkway (Boulevard) Mall, Nevada’s first enclosed regional shopping center; roadway improvements on Maryland Parkway, stated to be one of the finest duel highway avenues in the west; and a bright future for the area due to all the planned growth. 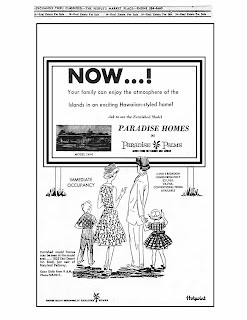 Our family that admires billboards is back again, this time admiring a Palmer & Krisel-designed Model 14H home, where one could enjoy the atmosphere of the Islands in an exciting Hawaiian-styled home. 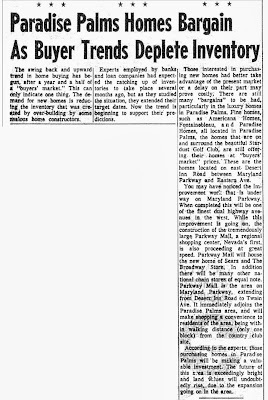 Home buyers could purchase model homes – including furniture – for quick move-ins. 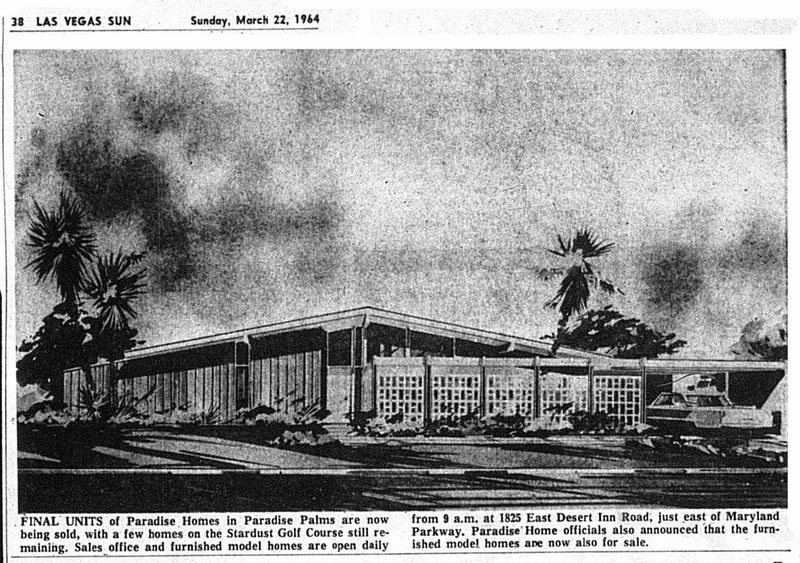 Interestingly, both the elusive 6H and 8E are shown to entice buyers; however only one 6H was ever built in Paradise Palms while no evidence of an unaltered 8E with signature floor to ceiling sliver window and vertical siding has appeared (all other Plan 8’s are well represented throughout our community in both original and altered forms). 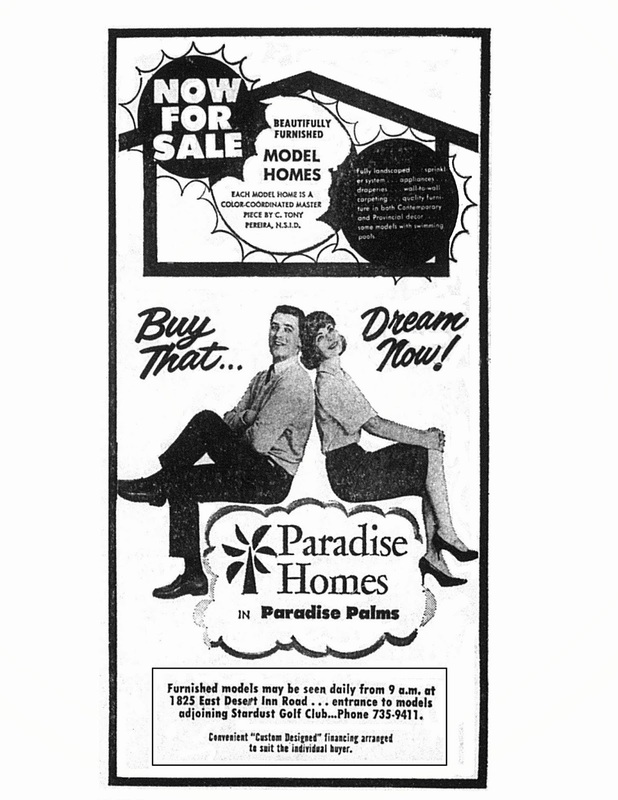 The final advertisements for Paradise Palms were a marked departure from previous ads. 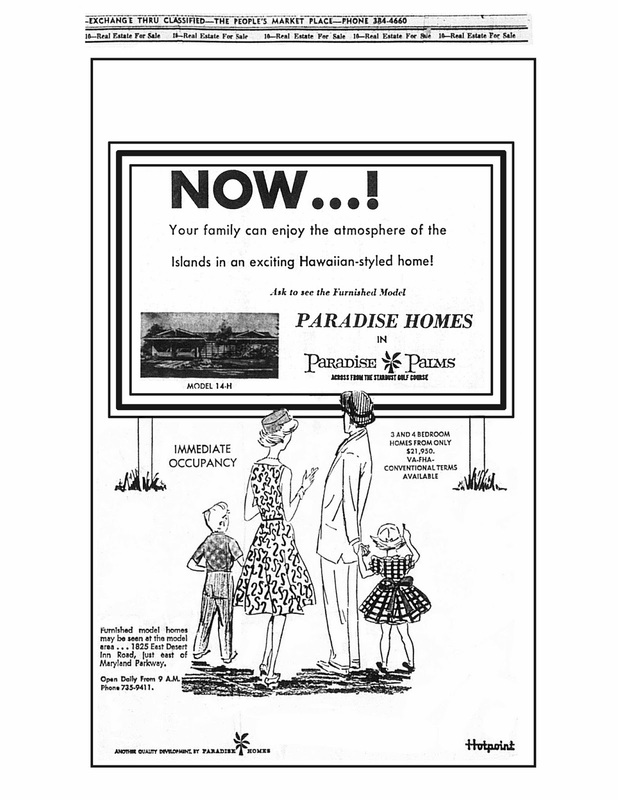 Simplified clip art-style graphics were now used, and for the first time real people were featured in ads. 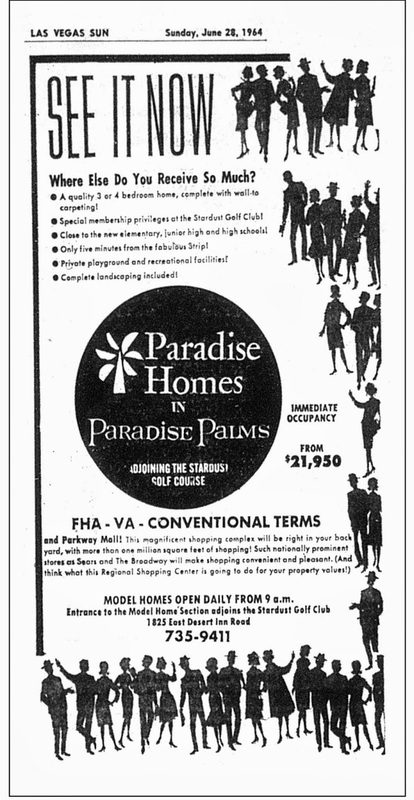 The style seen in the late 1964 ads is drastically different from what we saw with the grand opening ads of early 1962, no doubt reflecting changing times and practices. 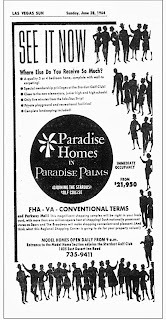 In the final ad we see that fully furnished models were offered for sale, a practice we saw with Americana Homes. In a time when the greatest entertainers and the best and brightest in hotel and management staff were lured cross-country to fast-growing Las Vegas, fully furnished homes gave buyers an instant start to their new lives in the middle of the Mojave desert.